Your help is needed to assist in clearing the Banadad Ski Trail. If you can help meet at, 9:00 a.m. Saturday September 30 at the Poplar Creek Guesthouse B&B. Please contact Ted Young, Boundary Country Trekking's Trail Coordinator by phone at 388-4487 or email at bct@boundarycountry.com if you plan to join us on Saturday or would like more information. Volunteers should wear work clothing, bring gloves and rain gear. We provide tools and lunches Everyone that works on the Trail receives free ski parking for the Banadad and discounted on overnight accommodates during this year's ski season. If you ski the Banadad, please help get it ready to ski. We really need your help! The following article was submitted by Guest Writer Nancy McReady, President of Conservationalists With Common Sense (CWCS). Ely, Minnesota- Just a reminder to the Friends of the Boundary Waters… there is no buffer zone to the Boundary Waters! The last buffer zone – the portal zone – was added to the Boundary Waters in 1978. As far as protecting against land disturbances in the forest, the Shipstead-Newton-Nolan Act long ago provided protection of natural water levels and that no logging take place within 400 feet of shorelines. Lake associations such as WICOLA – White Iron Chain of Lake Association have done a great job of monitoring area lakes that flow into the Boundary Waters, and with new equipment they will be doing an even better job. As for ensuring healthy habitats for the forest’s species, what about the healthy habitat of communities that border the Boundary Waters? The litigation brought against nearly every timber sale in the forest (the Echo Trail and the Gunflint area are just two that come to mind); opposing a cleaner safer way of mining precious metals on the Iron Range; the lawsuit against the South Fowl Snowmobile Trail; and the still unsettled issue of permits for the three Chain of Lakes... these all affect the habitat of our communities. Communities surrounding the Boundary Waters are not healthy. Just looking at the Ely School District, there are big signs of an unhealthy community. Back in the 1970s, graduating class sizes were 150 students. Even in the 1980s, graduating class sizes were well over 100. This year, the 2007 Senior Class has 55 students and the kindergarten class has only 41 students. School enrollment has decreased in many other school districts of northern Minnesota, mainly because of the lack of good paying jobs that would bring skilled workers and their families to our communities. Voters in the 8th District need to know where Congressman Oberstar and Senator Grams stand on these public land and water issues. These are issues of great importance to residents of our district. The Famine Lake wild fire along with the Redeye Fire when discovered were both small 1-5 acre blazes. The Famine Lake fire was located north of Brule Lake and west of the Cones and the Redeye fire south east of Winchell Lake. Both were started from lighting strikes from a storm that went through the area on the night of September 6 or 7th. According to fire officials initially the two fires were aggressively fought with water drops. Unfortunately this initially attack lasted only a short time before the water bombers were diverted to other duties. Granted there were other demands on the planes. However, these two fires were still small and if the planes had remained longer there was at least a good chance they could have been put down just as the other small fires in the area were. After the initial attack, it was next decided to adopt a strategy for the Famine and Redeye fires to "monitor and confine the fire to natural barriers." The reasoning was that these two fires were in remote areas of the BWCA. However given the extreme dry condition of the forest and the prediction by NOAA of "red flag" wind conditions arriving after Thursday, Sept. 14th, the Forest Service's strategy again of course failed just as similar tactics had failed in the Alpine and Cavity Lake fires. On Friday (September 15) and Saturday the wind hit and the two fires exploded and start to move north by northwest toward the Gunflint Trail. Saturday at about one-thirty P.M. the Cook County Sheriff fearing the Famine Lake fire might soon spread to the Gunflint Trail, called for an evacuation of the Gunflint from the end of the old Gunflint Trail road to the narrows on Gunflint Lake. At that point no one seems to know just where the fires were. According to fire officials speaking the next day at the fire information session the fire never reached the "trigger line" which had been set to declare any evacuation. As for the evacuation some residents and guests heeded the sheriff but many others did not and stayed. A fire map distributed by the Forest Service entitled "Current East Zone Fire Locations, Superior National Forest 9/13/06," The Famine and Redeye fires were first spotted on 9/8/06. It was not until 9/11/06 that additional fires were spotted in the Forest. If this was the case why was the fire fighting attack on these first two fires prematurely called off if at that time they were the only two fires the fire fighters had to contend with? Or was the information fire officials were distributing incorrect and the fire actually were spotted at a later date. Whether the Famine and Redeyes fires were spotted on September 9 or at a later date according to fire officals there was an initial attack by air on these fires. The question remains- why, given the extreme dryness of the forest and the prediction of heavy winds, did the Forest Service call off this initial attack on these two fires? Or why did the Forest Service even bother to waste the initial water drops on the Famine and Redeye fires anyways if they were not going to bother to get these fires under control in the first place? Grand Marais, MN- The Gunflint Trail Scenic Byways Committee voted to accept the Minnesota DNR's modified timber harvesting plans at this months byways' meeting held at the historic Swanson's Lodge on Hungry Jack Lake. 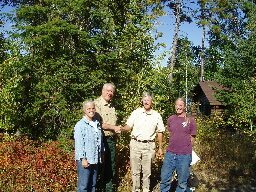 In picture Cook Country Commissionar, shakes hands over agreement with Doug Rowlett, DNR Area Forest Supervisor while Nancy Seaton, Byway Chairperson and Jim Raml, Forestry Sub-Committee Chair looks on. According to James Raml, scenic byway forestry sub-committee chair, "at this point the DNR appears to have made a good faith effort to accommodate many offer concerns dealing with the issue of clearcutting along the scenic byway corridor while still meeting their perceived fiduciary responsibility to the school trust fund and wood fiber output objectives. Two of the seven cutting blocks within the sale under question were removed for lack of merchantability reasons due to the young age of one stand and the relatively low volume in another. Also, wording in the newly written sale would allow for a higher than normal amount of advanced young conifer regeneration to be maintained on site in the remaining five cutting blocks.In addition, a more diverse selection of older trees, including conifers, will be included in the standard six to twelve leave trees peracre as well as a few islands of diverse species concentrated in areas nearest the scenic byway right of way." "The other major change" Raml continued, "within these sales is a clarification on the regeneration plan for the sites. Originally the plan would have allowed all but one of the sites to regenerate into aspen. The newly written plan calls for the planting and seeding ofappropriate mixes of pine, spruce and cedar on all cutting sites within the sale thus increasing within-stand diversity." "While we recognize the need of timber management for ecological andeconomic reasons, we feel that these adjustments will better meet the scenic byway objectives of maintaining and enhancing age class and species diversity while increasing the component of longer lived conifers within the forests along the Gunflint Trail. In arriving at this accord we feel we have developed a good working relationship with the Minnesota DNR's Area Forest Supervisor Doug Rowlettand his staff," according to Raml. In other developments Nancy Seaton announced, at the meeting, that the wayside picnic areas proposed by the committee at the Laurentian Divide overlook and Magnetic Rock Trail are now open and the trail to the latrine at the Swamper Lake picnic area has been cleared. "Further, one of our first projects, the painting of the Grand Marais Water Tower which will include the Gunflint Scenic Byways "moose" logo is now underway and should be completed soon," Seaton stated. Sue McDonnell also announced, at the meeting, that at the request of area resident fire fighters working on the Cavity Lake fire, with some extra time on their hands, took on the clearing of the Seagull Nature Trail, near the End of the Trail Camp Grounds. While this beautiful trail had been littered with down trees and brush for many years, it is now open again. 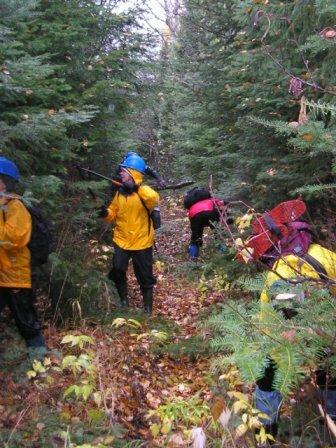 Grand Marais, MN- The Banadad Cross Country Ski Trail Committee is seeking volunteers to assist in clearing the Boundary Waters Canoe Area Wilderness' (BWCA) Banadad Ski Trail. Volunteers are needed for the weekends October 27-29 and November 17-19. For volunteers requiring overnight accommodates there is a minimal charge to cover cost of meals. Those staying overnight work all day Saturday and Sunday morning. Overnight accommodates are provided at the Poplar Creek Guesthouse Bed and Breakfast or a nearby cabin at the eastern end of the Banadad halfway up the Gunflint Trail. Volunteers provide work clothing and sleeping bags. In return for their assistance, volunteers receive a discount on Boundary Country Trekking's overnight accommodates during this year's ski season. Each fall some 600 hours of volunteer labor is required to clear the summer's accumulation of brush and down trees along the Banadad before the trail can be opened for Nordic Skiing in the winter. The following is the first of two installments on getting the Banadad Ski Trail ready for skiing. This first article deals with what we did last year to open the trail. The second article concerns what is needed to get the trail open this year and is entitled, Help Need! BWCA Ski Trail Clearing Volunteers Sought. Ski trails just do not appear tracked and ready for you to step into your skis and head out. Many hours of labor are required before the first tracks can even be set. In the case of the BWCA's Banadad Ski trail this is even truer! Twenty-six kilometers of the Banadad lies within the BWCA Wilderness. Within the BWCA all maintenance must be done with hand tools. And this takes time- lots of it! Last year Boundary Country Trekking (BCT), which maintains and tracks the Banadad logged 604 person hours of labor, just to get the trail open for skiing. Within the wilderness portions of the trail all the work was done by hand and usually required crews to walk and in two-instance canoe many miles just to get to their work site on the trail. According to Ted Young, trail administrator from BCT, "opening the Banadad is always demanding due to the Forest Service's restriction on the use of power tools within the BWCA. However, last year it was particularly difficult as a result of several sever windstorms that wiped through the area in mid November. In the storms' wake the trail was littered with down trees. But as always, we got the job done. The Banadad was opened. Last year's Banadad trail work began in early fall. The first maintenance crew was a six person team from the U.S. Forest Service who canoed into Rush Lake where they set-up a base camp and from there they worked on a remote 1/2 mile section of the trail. Because of the remoteness of this section, it had been years since it was last cleared. Then over the weekend of October 21 twelve members of the Twin Cities' based North Stars Ski Touring Club augmented by BCT's staff put in over 200 person hours working on the trail. The North Stars first assignment was another remote interior section on the trail's west-end. To get to this section the North Stars first canoed one and one-half miles down Tucker Lake. Near the west-end of the lake they landed their canoes. From here they "bushwhacked" through the woods along an unmarked section line 3/4-mile climbing over trees and through the thick brush to the trail. By noon it began to rain. On the trail the North Stars' divided into two groups- the larger group, armed with loppers, hand saws and a pole saw headed east to cut the side brush and trees that was slowly choking off the ski trail's right-away. The smaller group headed west - their assignment was to cut out any major trail brush or down trees.The crews worked all day; the rain continued. By the end of the day the soak crew had successfully widened 1/2 remote mile and opened another mile and one-half of the Banadad. Then it was "bushwhacking" back through the woods to the lake, paddling back down the lake to the canoe landing and return to their home base. Needless to say the crew was wet and cold upon their return. The next day, Saturday, with the rain still coming down the North Stars crew's assignment was to widen the most heavily skied section of the Banadad from the eastern trailhead to the Lizz Lake Portage. Another wet day with another socking wet crew but by day's end the job was completed. Locals also pitched in on the trail. On November 11 a group of local skiers removed several large trees and cleared brush from the Banadad's western end. The crew also hand carried in six heavy loads of railing material 3/4 of a mile to the new Dawkins Creek's bridge and then assisted in install the railing. The Minnehaha Academy High School's Nordic Ski Trail, took on another maintenance assignment. They arrive on November 11 and worked a day and one half logging one hundred plus hours of labor. The first day the team cleared about a mile just east of the new bridge on the trail's west-end. The next day, November 13, the Gunflint was hit with its first major winter snow storm, when the blizzard conditions stopped at the end of the day five to six inches of new snow was on the ground.The new snow, however, did not stop the Minnehaha Academy's crew from continuing the clearing of the brush from the Banadad. The six girl their coach and another parent spent the better part of this day in the snow working on the trail's eastern end. By mid November with enough snow on the trail to begin the final opening process BCT's staff took over. BCT crews began packing the trail with snowmobiles towing compactor bars and removing the remaining brush and down trees as they went. This year BCT logged another142 hours during this final trail packing/opening process. According to Young, " I think all skiers who skied the Banadad last year should give a special thanks to the efforts of the North Stars, the Minnehaha Academy Ski Team, and the other volunteers for their help in getting the Banadad open and for the many other years they have volunteer their time on this trail." Young continued, "Without these volunteers I am not sure how we would ever be able to maintain this beautiful wilderness ski trail. This year if you are planning to ski the trail; how about lending a hand and pitching in on the maintenance." The Banadad is a 30 km. public tracked ski trail connecting the Central and Upper Gunflint Ski Trail Systems. Most of the trail is within the BWCA. The trail was built 1982 by the USFS under a provision of the 1978 BWCA Act which mandated the creation of new BWCA ski trails and authorized the grooming of some of these trails by snowmobiles. Only two BWCA snowmobile groomed trails, the Banadad and a short portion of the Central Gunflint's Old Logging Camp Trail have been so designated by the USFS. The Banadad trail system is supported, in part, by the State of Minnesota's Ski Pass. However this State support covers only about half of the actual annual operating expenses of $11,000-$13,000/year and the state contribute nothing toward the cost of plowing the extra parking spaces required to accommodate day skiers. The funds that are receive go to help support the volunteer expanses including, lodging, food, supervisory staff etc. and BCT's staff and equipment. To help defray costs of providing parking space for day skiers a parking fee is charged at the Poplar Creek Guesthouse B&B parking area. Day skiers parking fee is $10/day car. However, parking is free for all volunteers who have worked on the trail this year, members of the North Superior Ski and Run Club and Sugarbush Trail Association members. Parking at the Banadad's western trailhead located 1/4 mile south of the Loon Lake Public Landing is free. Parking here is limited to 2-3 cars. Access to the trail is also available at the Swamp, Lizz and Meeds Portages from Poplar Lake.